The 73rd annual Golden Globe Awards, held in The Beverly Hilton in Beverly Hills, California last January 10, 2016, was surely a night to remember for the huge stars who won that night. Leonardo DiCaprio won a Golden Globe as the Best Actor in a Motion Picture - Drama, but what he did while sitting at his table became more buzzworthy for netizens all over the world than when he accepted his award. Leo DiCaprio and Lady Gaga. 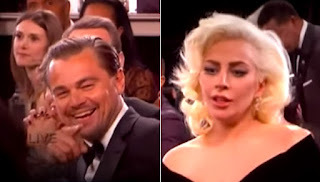 It was because when Lady Gaga's name was announced as the winner of the Best Actress in a Miniseries or Television Film award, the startled expression on Leo's face as she brushed past him became viral that it became the highlight of the night. DiCaprio later revealed in This Morning, a British daytime television programme, that he "had no idea who was passing me or what was going on" when that happened and was actually laughing about it with Lady Gaga and her fiancé, Taylor Kinney, as they were partying at the CAA bash at West Hollywood's Sunset Tower.